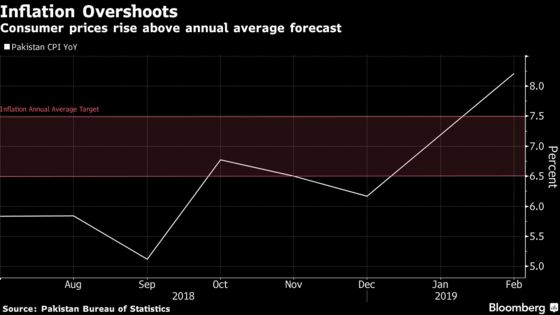 (Bloomberg) -- Pakistan’s central bank raised its key rate for a sixth straight time as inflation accelerated outside the range projected by the monetary authority and concerns about fiscal consolidation persisted. The target policy rate was raised to 10.75 percent from 10.25 percent, the State Bank of Pakistan said in a statement. All but one of the 31 economists surveyed by Bloomberg predicted a hike, with 13 of them predicting it accurately.